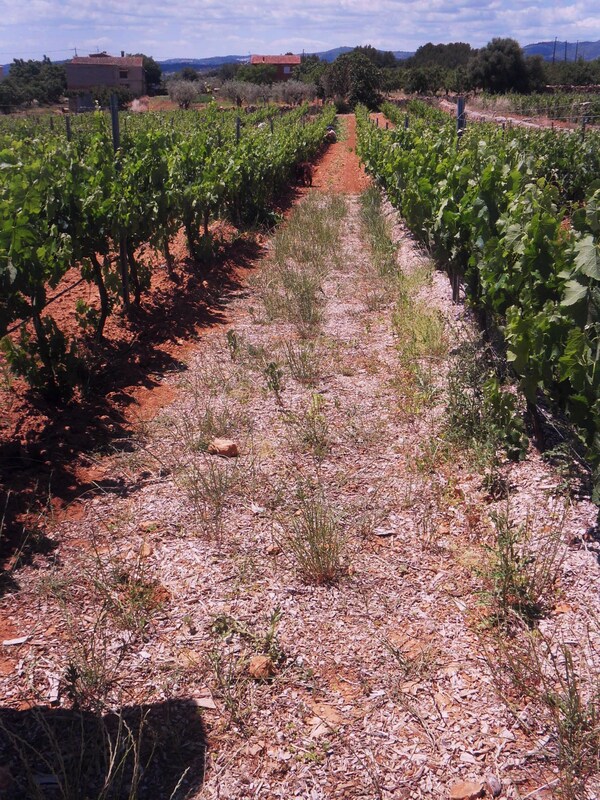 Bodegas Baron D´Alba – In search of the Perfect Soils. 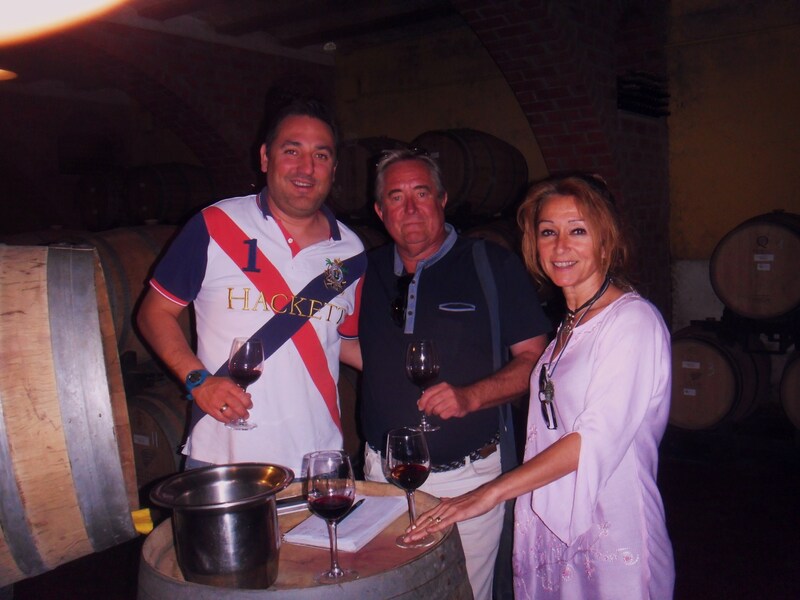 Back in December 2013 we visited the Les Useres ( Castellon) bodega owned by Sergio Garrido as part of an educational trip looking at new wines and wines developing in deposit and cask. 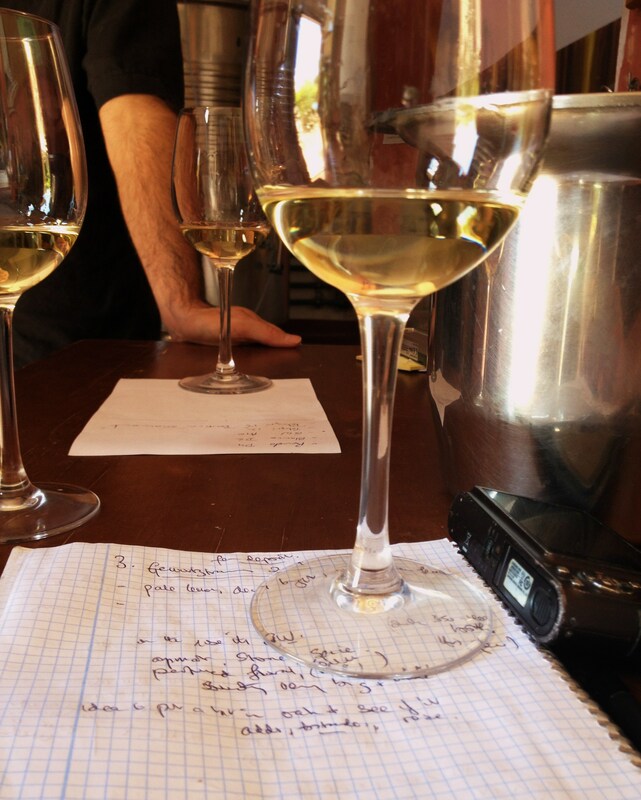 This is an important part of our work in giving wine tastings because we are often asked technical questions about wine-making methods in the Valencian Community. The reality is there are many twists in wine making where enologists have their own personal ideas and practices to obtain the best results from the material the vine-grower provides them at harvest time. Of course any wine-maker will have commenced his work long before the harvest, ensuring the vines are not being stressed by asking them to produce too much. Pruning at the post flowering stage and removal of unwanted shoots ( poda en verde) is one of the first issues to be dealt with at the end of Spring. At Clos D´esgarracordes the soils have always been important. 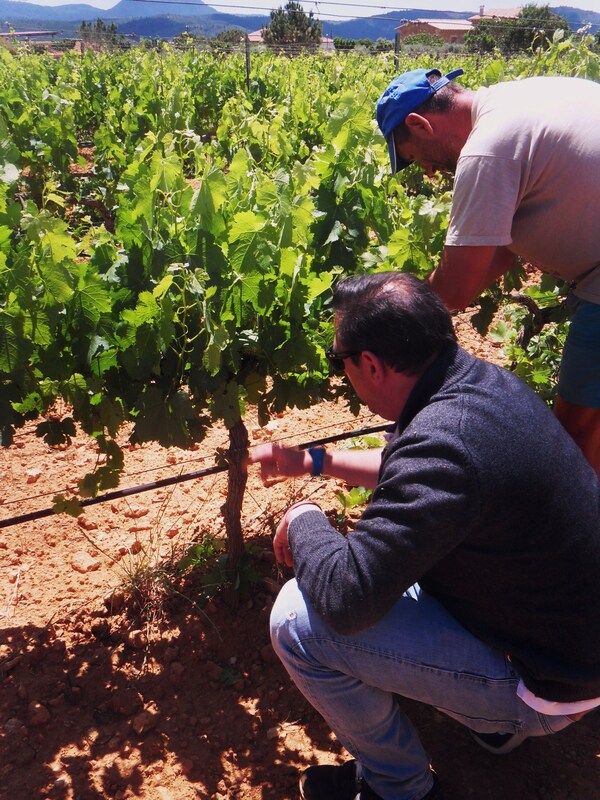 Wine maker Mario Malafosse who has been there for four years working with Sergio Garrido, makes the soils his number one priority. 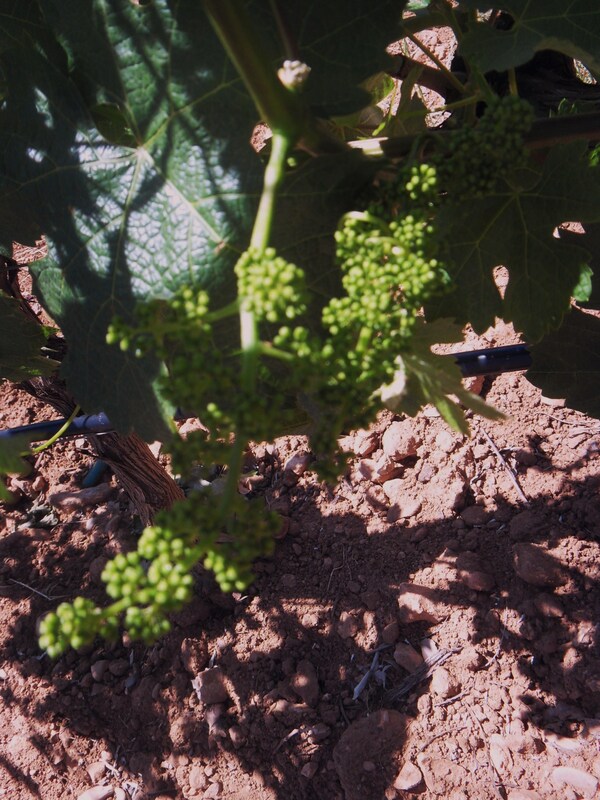 On VÍ vid´s follow-up visit yesterday ( at which we were once again to taste the new and developing wines) we started with a walk into the vineyards to look at the flowering taking place in the Cabernet Sauvignon variety. From here we went on to look at the Merlot where `poda en verde´ was taking place, the two arms of the vines were being stripped of the excessive growth as were shoots coming from the base of the vines. This involves removing some of the putative bunches so that the vines do not produce more than around 1.5-2kg each of grapes. Here, Mario has been experimenting with green manure to feed the roots of the vines and improve the soil. Soil is a priority for both Sergio and Mario. The former has always wanted his wines to express the land ( or terroir) from which they come ( a mixture of sand and stone.) For Mario it has been his major study as an enologist. Experimental area with wood chippings. Currently they are experimenting with different ground cover such as growing broad beans down the middle of the rows of vines. These fix a lot of nutrient into the soils, enriching them and subsequently benefiting the vines. They also protect the soils from the direct sunlight. But they have also experimented with sawdust and wood chippings packed around the base of the vines to act as a mulch and keep moisture in. Certainly the vines receiving this treatment had a much more humid soil. Sergio Garrido demonstrating Poda en Verde. Nor could you help but notice that the soil had a lot of spores growing in it, a sure sign that it was alive with nutrients. Not that any wood will do of course, pine for example does not work because of the resins it holds! We returned to the bodega and commenced our tastings from the deposits and barrels. Starting with the 2014 Rosado, still to be filtered but ready for bottling this is a blend of Monastrell, Garnacha and Syrah. Sergio and Mario are trying to produce a rosado which gives a nod to the fashion for paler wines without losing the essence of Valencian Rosados. Although a paler salmon than in the past it retains a brilliance in the glass. Moreover this is not a wine from free run juice , the press is used after a two-hour maceration to ensure that the characteristics of the soils come through from the skins. This will be a fresh , raspberry fruit wine with a natural sweetness balanced with a good acidity and a long dry mineral, even salty, finish. The best rosado we have tried from this bodega! Second was the 2014 Macabeo/Viognier blend which will make the new `Clos´wine. Both varieties have a short crianza in oak to enrich the wines, with battonage once a week.Second usage oak tends to impart less oak flavours into the wine , rather giving them a fuller body. This wine has it with lovely depth of fruit and balancing acidity. A wine to watch out for on release! The bodega´s Gewürztraminer has been much-lauded since its release last year and is a best seller at winefairs. This 2014 is the most expressive so far although sadly there will only be about 400 bottles because of last years drought. The 2014 is the most expressive yet, the fruitiest , richest and most spicy with a finish that never stops developing! Sergio Garrido with VÍ vid. Moving to the reds, `Pelegri ´ is the bodega´s top wine in the `Collection´ series.In 2011 the wine was a French style Cabernet Sauvignon, full of green and black pepper and an excellent wine. 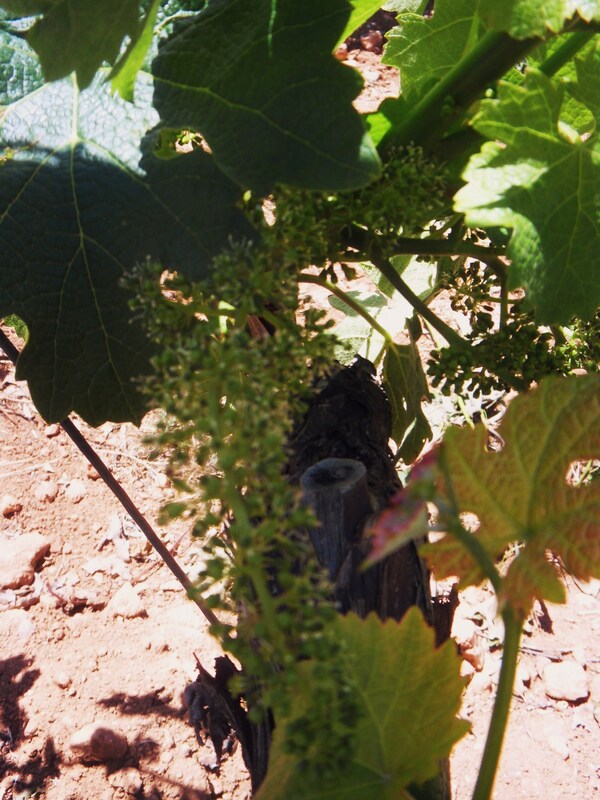 But, Pelegri will be made from the variety which performs the best each year and in 2012 that was the Syrah. In 2013 it will be the Merlot. We tasted both, the Syrah from deposit where, having been stabilised it awaits bottling and the Merlot from barrel where it has spent its first year in wood. The Syrah is a bright chery colour, the wine painting the glass. On the nose it is very expressive with tobacco, chocolate, pepper, plum and fruits of the forest. In the mouth the tannins are smooth and the the wine powerful This will be a worthy successor to the Cabernet! 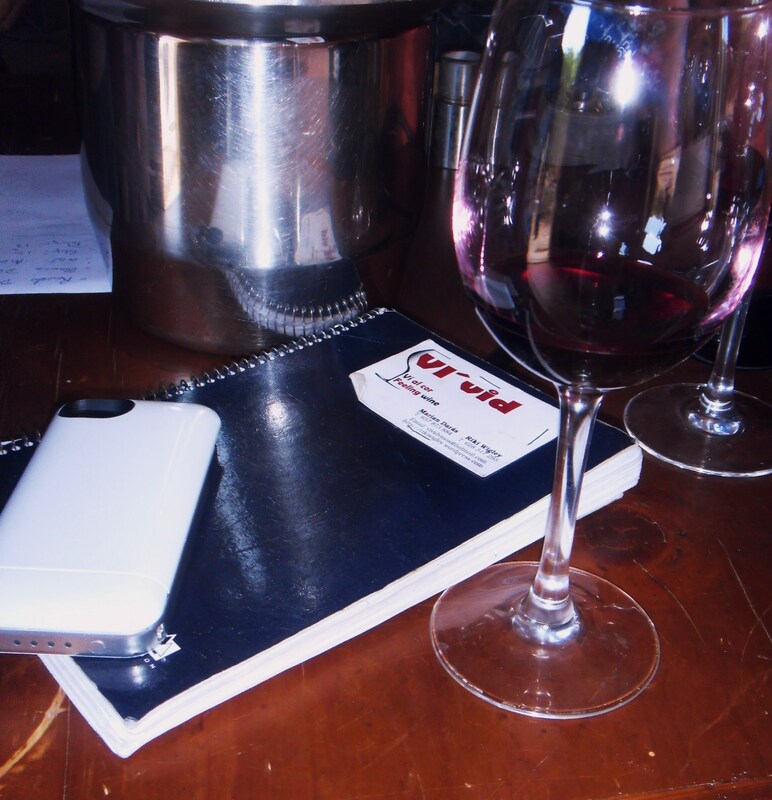 The 2013 Merlot is a plum colour, youthful and still has more time in barrel to come. 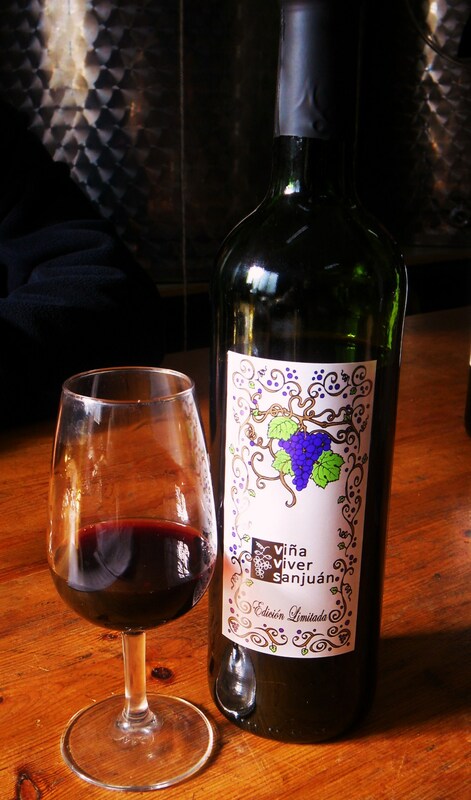 There is a lot of jammy fruit, black pepper, but at the moment it is quite tannic. Huge potential this wine. We look forward to tasting from barrel or from deposit next year before bottling! 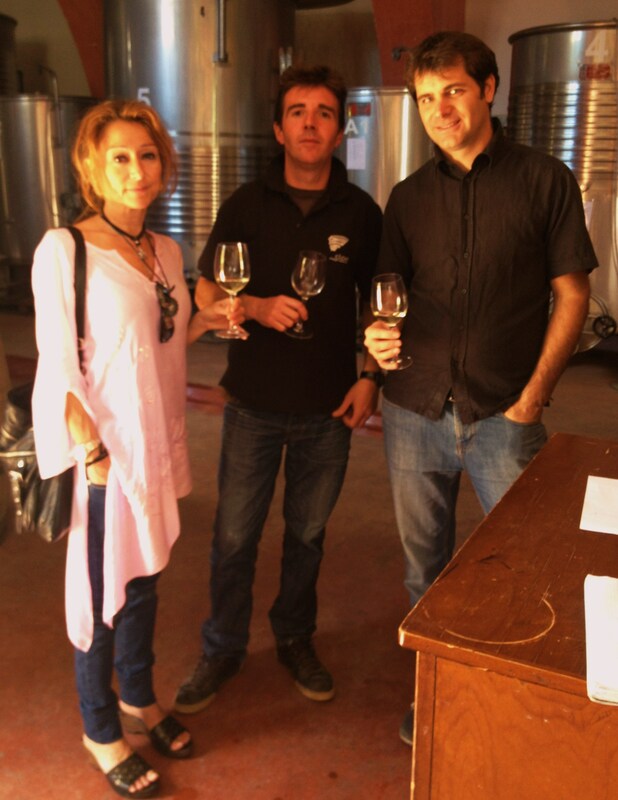 Marian, Juanjo and wine-maker Mario in the bodega. Finally we tried the Monastrell 2013 which is fresh, fruity and aromatic with big hints of violet in a floral nose. 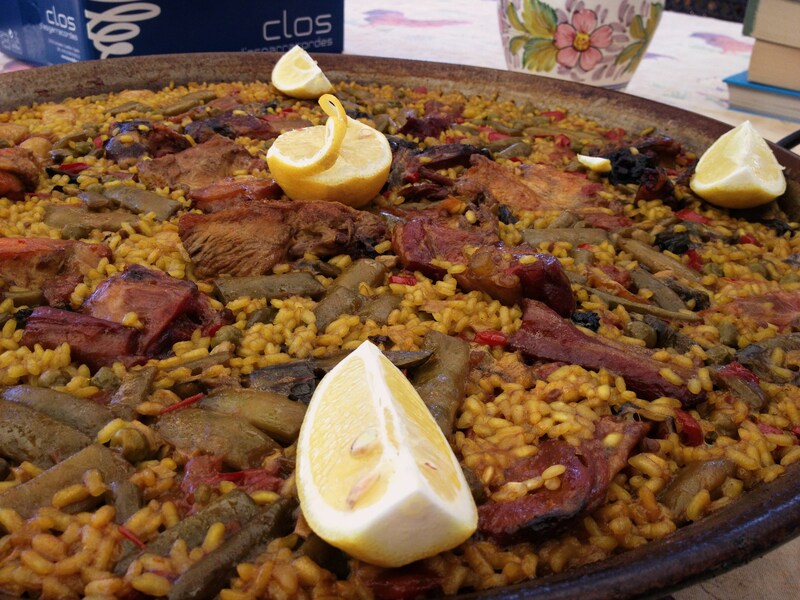 Over lunch, which consisted of a local paella with rib of pork, rabbit and chicken with vegetables we continued our talks and discussed a range of issues. We were given one final surprise! Sergio and Mario have been experimenting with a sparkling wine to add to the range. 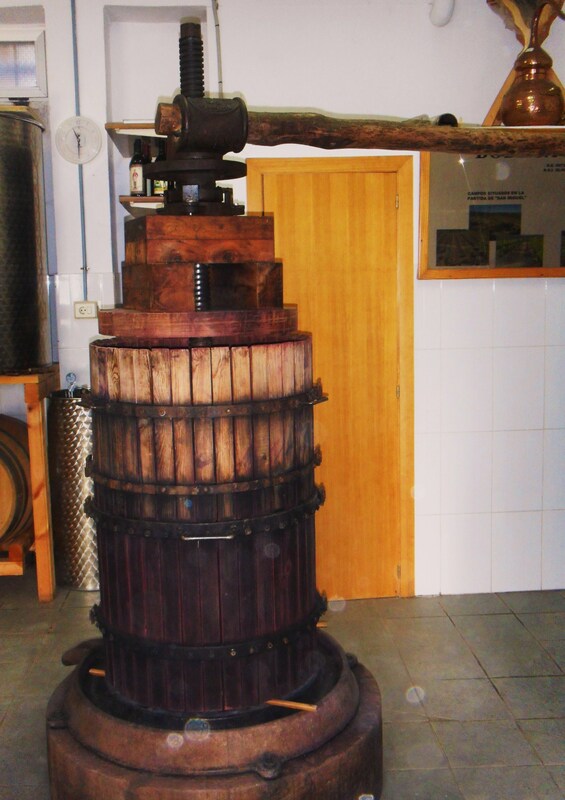 Castellon is outside DO Cava so although it will be made by the traditional method it will be an `espumoso´. We tried a bottle to finish off the meal and it showed great promise with a year, so far, in bottle on the lees. We are very pleased to have this bodega as an associate and to be able to promote their wines in future tastings. 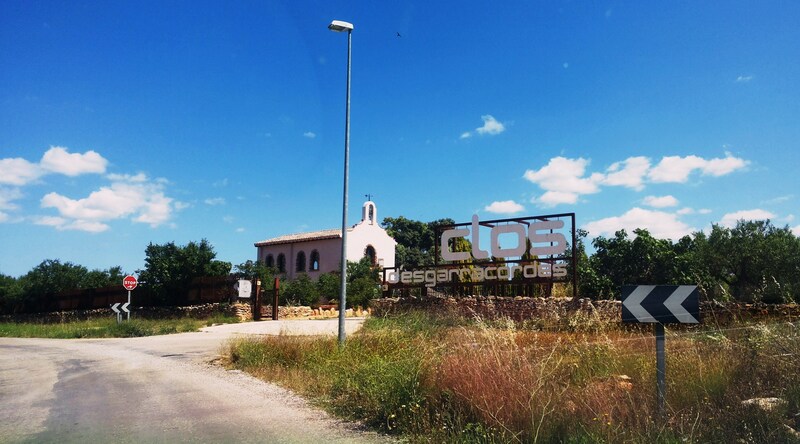 we look forward to a long continuing relationship with them, a bodega whose owner and winemaker have a clear idea of their style and want to ensure the future improvement of the vineyards and with it the wines! 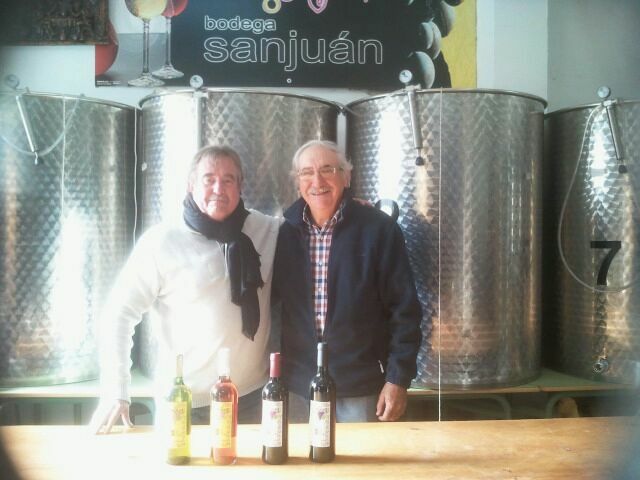 A Visit to Bodegas Viver Sanjuan, IGP Castellon. The very Old Press, Still in Use! 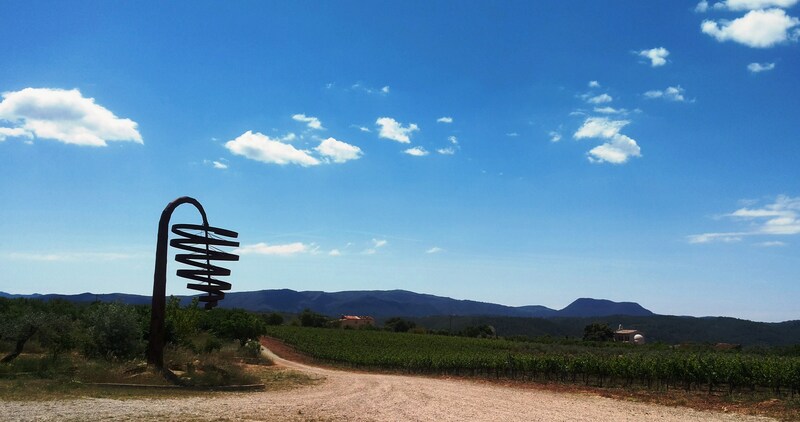 Formerly a Professor of Philosophy, Ismael and his family set about recovering a tradition in 1991 when the project began with the purchase of parcels of land, vines, their planting, and subsequently the production of the first wines about 8-9 years later. 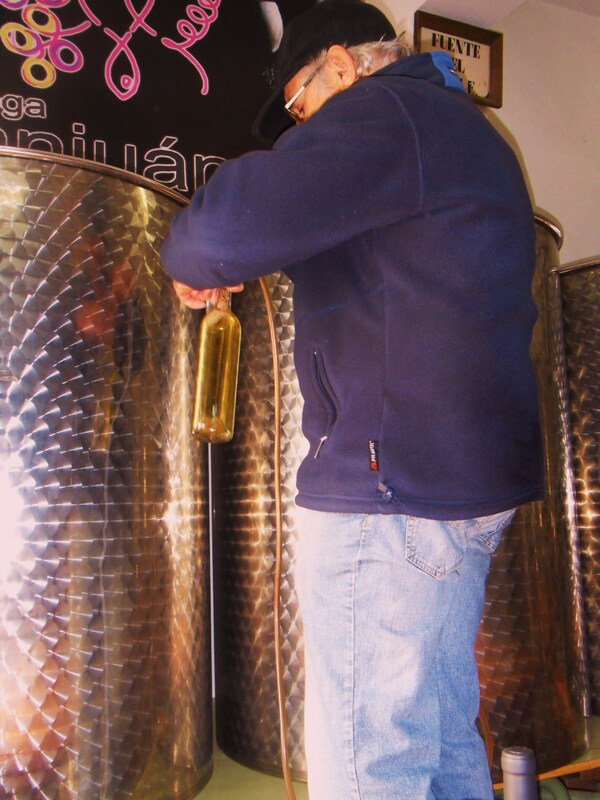 Today Ismael produces wines using Chardonnay, Gewürztraminer and experiments with Sauvignon Blanc, Viognier and Semillon as well as a touch of Sultanina. In reds Tempranillo, Cabernet Sauvignon , Merlot and Syrah are the main varieties although he has some Mondragon, a local variety which I have so far failed to find any reference to. 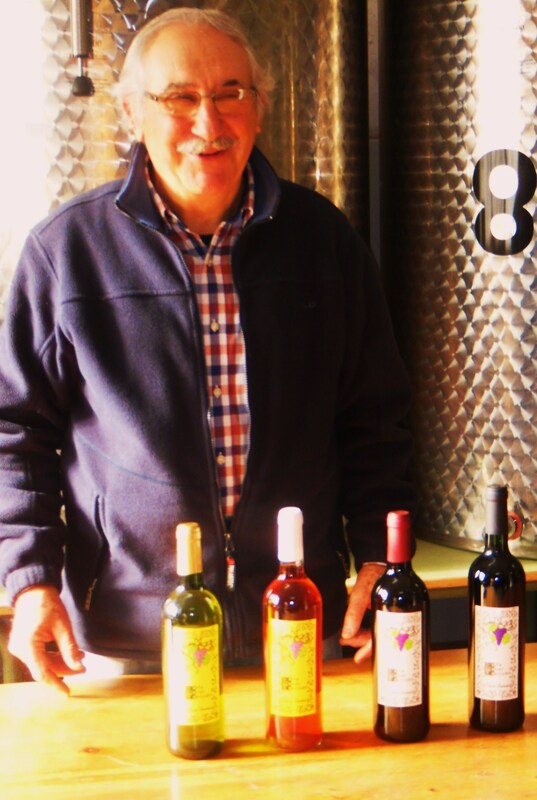 His wines are produced ecologically, biodynamically and in very small quantities ( around 5-6 thousand bottles a year) and are sold locally and in restaurants in Castellon city. This traditional and ancient method is balanced with modern scientific techniques. The wines are also unfiltered and produced from deposits which hold just 800 or 1000 litres. Each variety is vinified separately . For the Tinto Barrica French and American oak is used. The soils are limestone, sandy and stony but given the hanging fog and cold morning we passed on the opportunity this time to go and visit the terraces and mountain slopes where they grow. 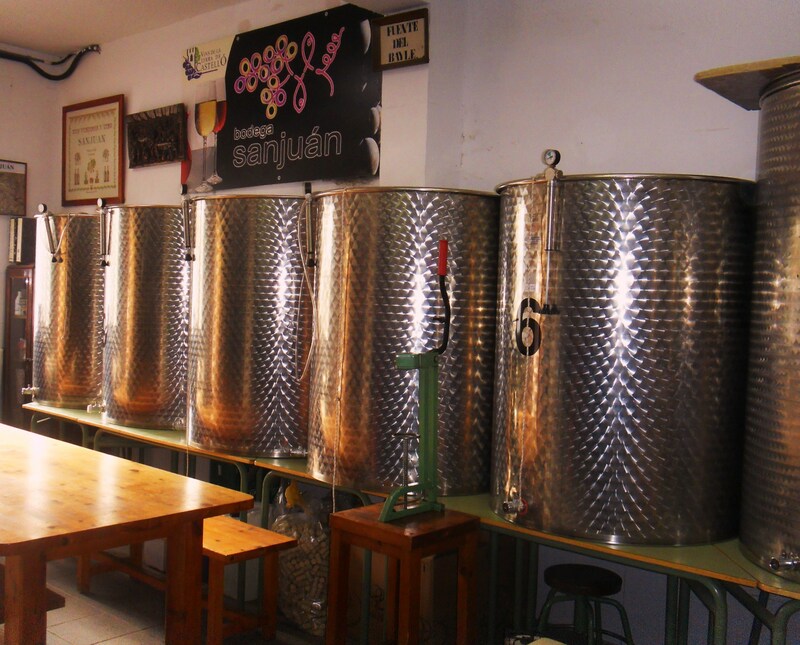 Normally the bodega ( which is currently undergoing some reconstruction work ) offers five wines, whites from Chardonnay and Gewürztraminer, a rosado and a tinto joven and barrica. 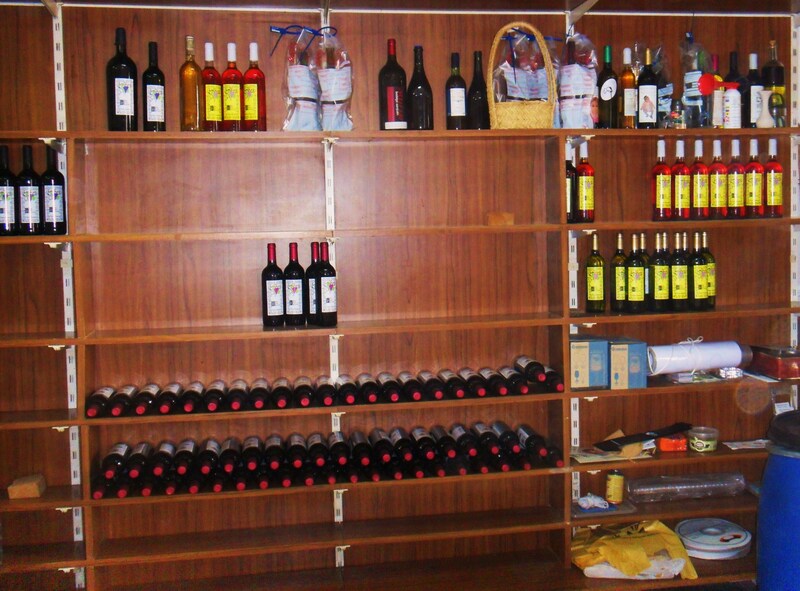 Certainly the shelves are bare at the bodega now and until the new vintages are bottled and ready! Empty Shelves in the Shop! 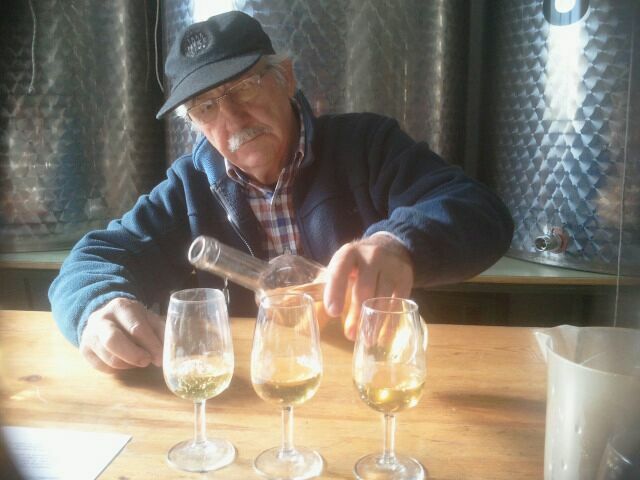 As always, the purpose of the visit was to taste and evaluate what Ismael does have to hand! We were not to be disappointed! We started with the 2013 Chardonnay from deposit. Drawing Chardonnay From the Deposit. At 13%ABV, pale gold in colour the wine is ready for bottling and will be in the next couple of weeks. It is clean and bright with golden flashes. The nose is quite closed, not unusual in wines which are stabilising but green apple was evident. 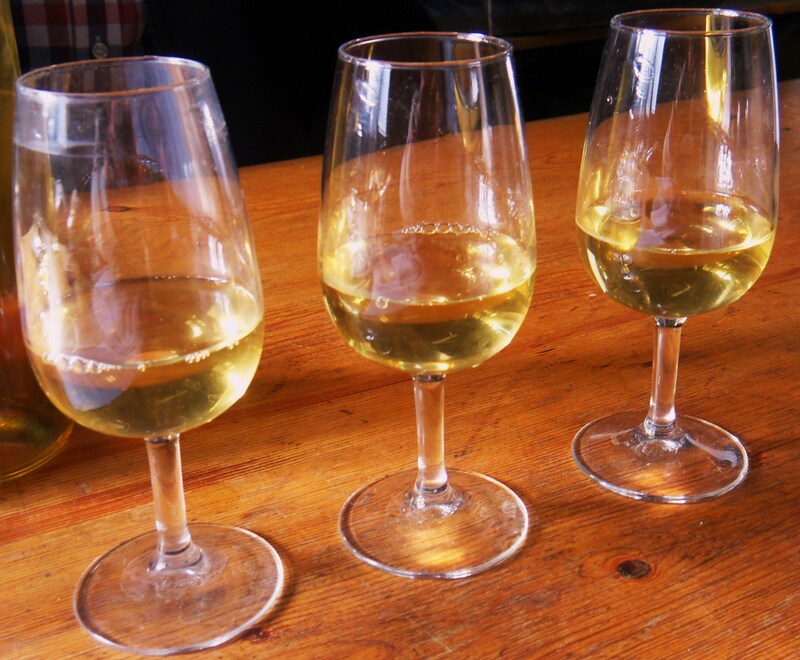 In the mouth the wine was initially green, but again the apple and then citrus notes began to develop. The wine needs bottling and a period of rest but I would love to revisit in about three months time because the potential is evident! The second white is a Gewürztraminer 2013, also from deposit and ready for bottling now. This had been picked a couple of weeks before the Chardonnay and its development was more marked. It is around 12.5%ABV. More golden in colour with green flashes, clean, bright and with long, slow legs. On the nose it is very floral, with marked spiciness ( white pepper) , fruity ( I could detect weak apricot notes) . In the mouth, tropical fruits ( lychees ) and rose petals were evident! The second mouthful was fuller and rounder as it opened in the glass, opulent, almost petrol, very nice and with massive potential. This is the second Gewürztraminer I have tried recently from deposit and it looks as though it may well have a future in Castellon! The two reds we tried were both from bottle and earlier vintages. First up was the 2009 Edición Limitada, a blend of Cabernet Sauvignon 50%, Syrah 40% and Merlot making up the balance. This wine has 11 months in a mix of French and American oak, and is 12.5%ABV. Intense red cherry colour, good slow legs. On the nose ripe plums and blackcurrant, and in the mouth whilst the oak was notable it balanced the fruit which was quite jammy, the wine is round, balanced, velvety smooth. It fills the mouth and has a long persistent finish…for all that, it is an easy drinker normally selling for around 6€ a bottle ( the others are all around 4€ each when available). Finally we tasted the 2012 Joven, a 100% Tempranillo. A vivid purple colour, very youthful looking still, and with good legs. On the nose red fruits, blueberries, strong varietal characteristics, floral ( violet) spicy, warm. In the mouth it is intensely fruity, almost to the point of boiled sweets, round, very full, well structured and very easy drinking with a long fruity finish. The project is still very much in development and with such small production is almost a hobby rather than an a going concern! But as we all know , these projects get a head of steam behind them and sometimes develop faster than expected. The wines are selling well as evidenced by the lack of availability….I suspect this is a family project with a long future ahead of it. Thank you Ismael for a fascinating visit!